Sunburst Shutters Indianapolis gives you everything you could possibly ask for from a window shutter. And a whole lot more! Plantation shutters in Indianapolis are a great window treatment for your home because they are exquisitely designed - both inside and out! Their louvers give your window a clean, in vogue feel. And we build our plantation shutters to provide you with energy savings and longevity so your lovely investment provides huge savings and increases your home’s value. Plantation shutters are incredibly adaptable, as well. By simply tilting the louvers, plantation shutters let in all the sunlight and view you desire. The louvers are the slats that you can shift to let more – or less – light into the room. They can be adjusted by using a mounted tilt rod. Whatever your specific needs may be, from unique window shapes and color matching to frame styles, Sunburst Shutters Indianapolis has the window shutters to accentuate your space. Where did the name plantation shutters come from? Plantation shutters are called that due to their common usage in large plantations and estates, chiefly in the American south, where they were used for their classy aesthetics in addition to their capacity to block heat from getting in. Which type of shutter do you suggest for my bathroom or family room? Any room will have some special needs. Because of that, we've put together our Total Room Window Treatment Guide to make it easier to find the top window treatment for each room in Indianapolis houses. Where are plantation shutters made? Polywood plantation shutters are completely built and assembled in the U.S.A. The various louver sizes of plantation shutters provide you with the most unimpeded view of your Indianapolis neighborhood while looking beautiful on your windows. Plantation shutters give you hands down the most light, temperature, and privacy, privacy, light, and temperature control of any window treatment. Differing louver sizes may also mean less louvers on your window. That’s why large louvers give plantation shutters their clean lines. A modern style and easy control of brightness and temperature make plantation shutters the favored choice of interior shutters in Indianapolis. Because of the way they’re put up on your window, plantation shutters act as an enduring fixture. When your house is appraised for resale, plantation shutters add to its estimated market value. You get to enjoy your shutters while you live there now – and gain back your investment later, when you sell your home. It’s a win-win situation. We design plantation shutters that fit your window and your home impeccably. That’s why we bring you these superior brands of custom plantation shutters. Crafted from a solid-engineered wood substitute, Polywood® plantation shutters won’t split, chip, warp, or crack. Not only that, but the color on our shutters will never yellow or fade. Our colors stay strong because we bake on our first-grade paint finish and combine it with UV stabilizers that make the premium synthetic resistant to the sun’s rays. So, no matter how intensely the Indianapolis sun shines, your shutters will look as beautiful as the day they were first installed! Polywood plantation shutters are also the top of the line in insulating shutters, letting your house become more energy efficient than ever before. Just take a look at the Polywood Insulating System® to find out about the energy efficiency benefits Polywood shutters can offer your home. We custom build all our Polywood shutters so they look beautiful on your Indianapolis windows – and work smoothly each time you open and shut them. If you need a premium wood plantation shutter, you have come to the right place. Ovation® hardwood shutters are hand-made from solid teak so you can be sure they are built for durability. A five-star wood shutter, Ovation shutters are provided in different louver sizes that showcase the durability of furniture-grade hardwood. Have a specific color in your head to go with your decor? Ovation plantation shutters are available in 28 beautiful wood stains and 11 stunning paints, so you can exactly match your current window trim or complement the color scheme of your home. We design all of our Ovation plantation shutters so they fit your Indianapolis windows perfectly and work effortlessly. Add a contemporary touch to your home with reclaimed wood shutters. 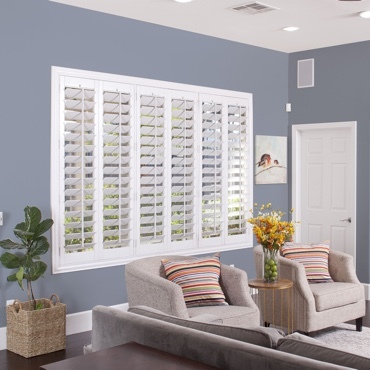 Each shutter louver has a unique blend of color and finish, crafted by Mother Nature herself. We custom make these shutters to match any window in your home. 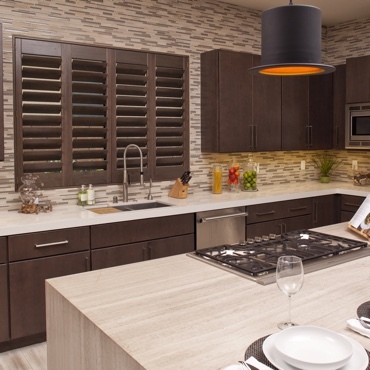 Studio shutters are the newest offering from Sunburst Shutters Indianapolis. Uniquely built to offer both the stunning looks of plantation shutters in addition to home value, Studio shutters are a sleek, smart window covering. Schedule a free in-home consultation today by calling 317-558-9066 or filling out the form below!